Invite friends via the FACEBOOK EVENT page! EXTENDED DEADLINE FOR SPECIAL HOTEL CONFERENCE RATE! BOOK QUICKLY BY EXTENDED DEADLINE: MARCH 19TH!! INCITE! 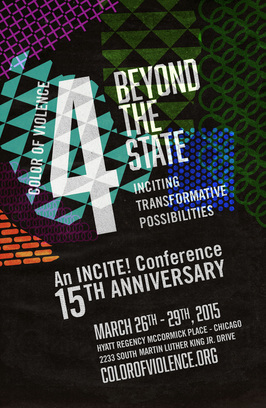 is excited to announce the upcoming conference, Color of Violence 4 (COV4)--Beyond the State: Inciting Transformative Possibilities. This gathering will mark INCITE!’s fifteen years of engaging in grassroots organizing projects, critical conversations, national actions, transnational campaigns, and community building strategies to end colonial, racial, and gender-based violence against women of color, trans and queer people of color, and our communities. Follow INCITE! on facebook and twitter for ongoing COV4 updates!